How does color and surface area affect ambient and surface temperatures? Figure 1. 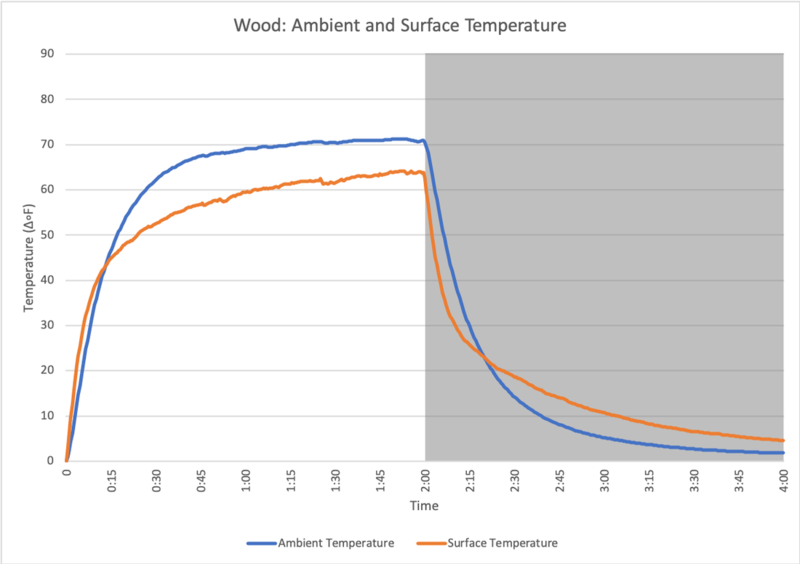 Comparison of ambient and surface temperatures in wood. Ambient temperature heats up quicker and cools down quicker than surface temperature. Figure 2. 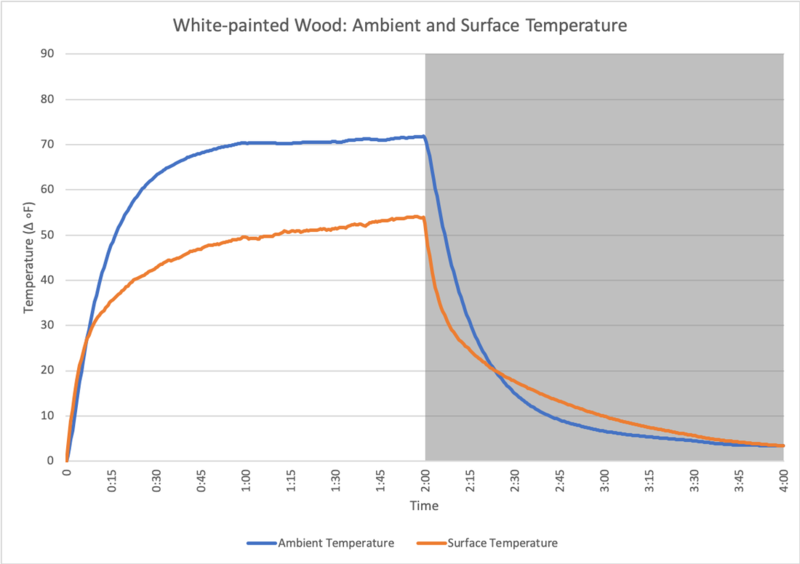 Comparison of ambient and surface temperatures in white-painted wood. 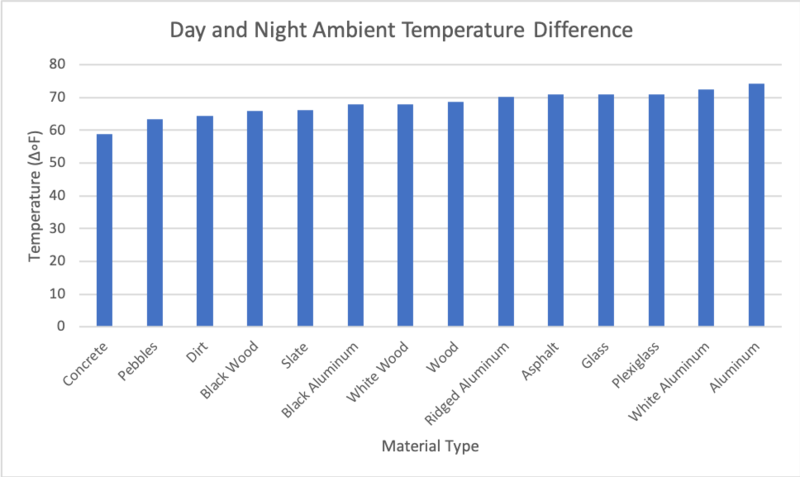 Ambient temperature heats up quicker and cools down quicker than surface temperature but there is a notably bigger difference between ambient and surface temperature during the day and smaller difference at night. Less distribution of heat and cooler surfaces as shown in thermal image. Figure 3. Comparison of ambient and surface temperatures in black-painted wood. Surface temperature is greater than ambient temperature in both day and night. High temperature heat is distributed along surface as seen in the photo. Figure 4. 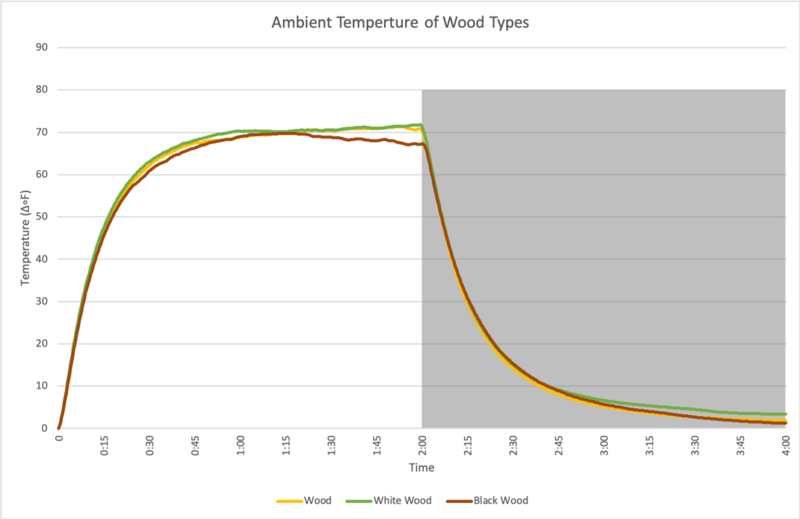 Comparison of ambient temperatures among wood, white-painted wood and black-painted wood. Not much variation is seen. Figure 5. 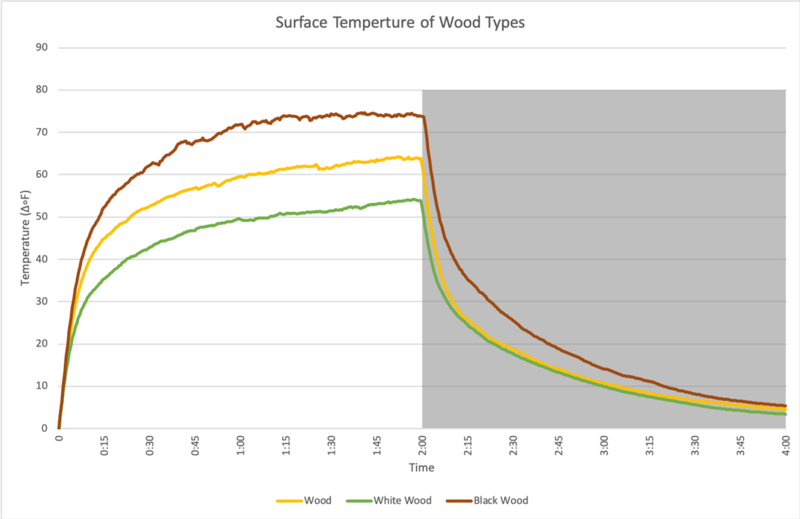 Comparison of surface temperatures among wood, white-painted wood and black-painted wood. 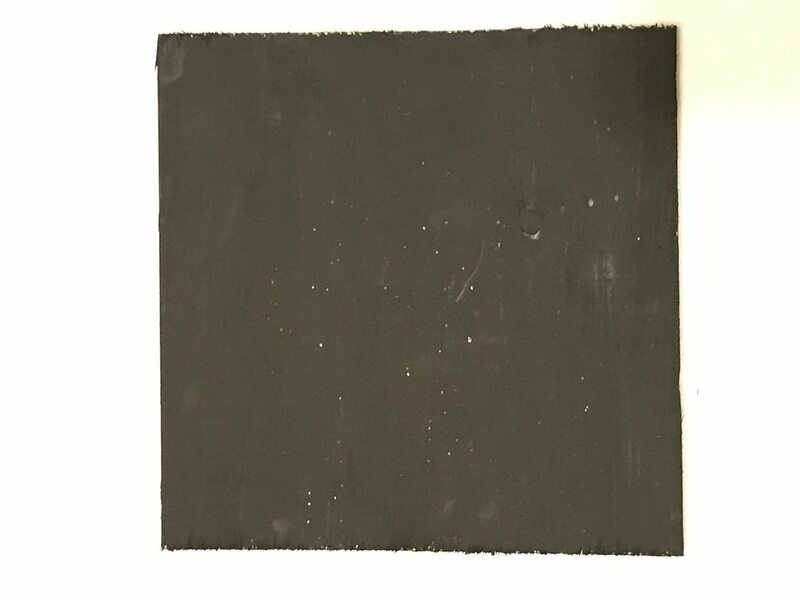 Black wood had the highest temperatures during the day and night. 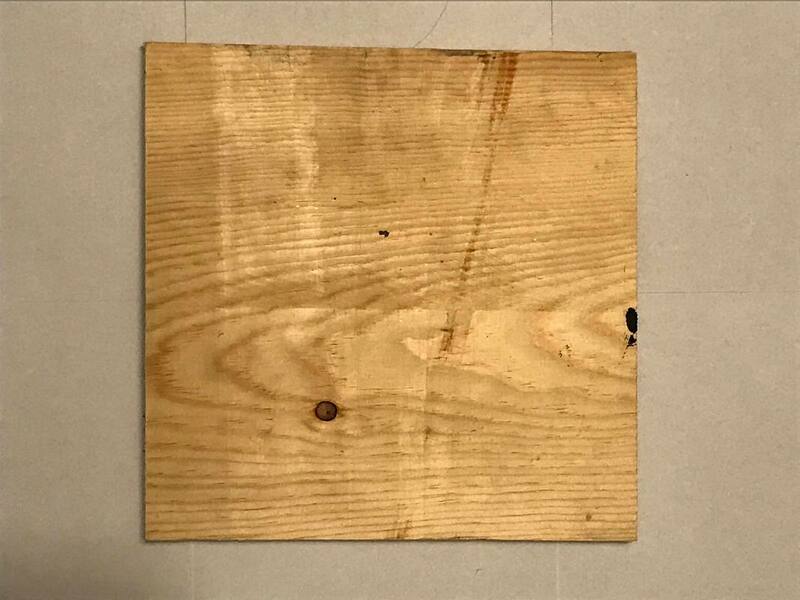 White wood had the lowest temperatures during the day and have similar surface temperatures during the night as wood. Figure 6. 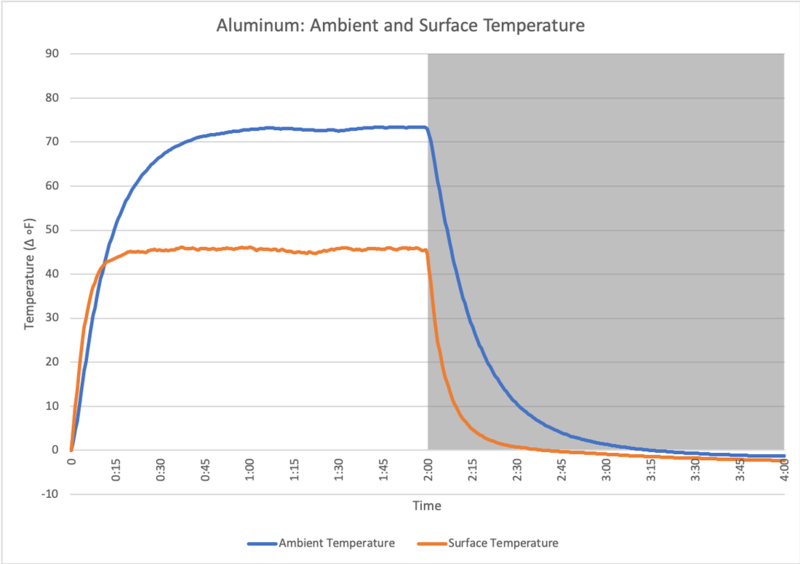 Comparison of ambient and surface temperatures in aluminum sheet. Surface temperature is considerably lower than ambient temperatures during the day and night. 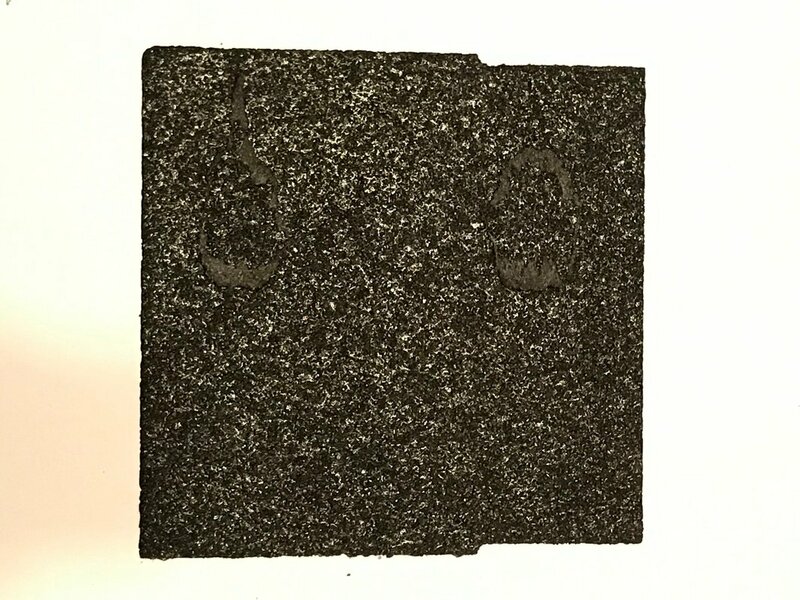 Photo shows even distribution of heat along surface. 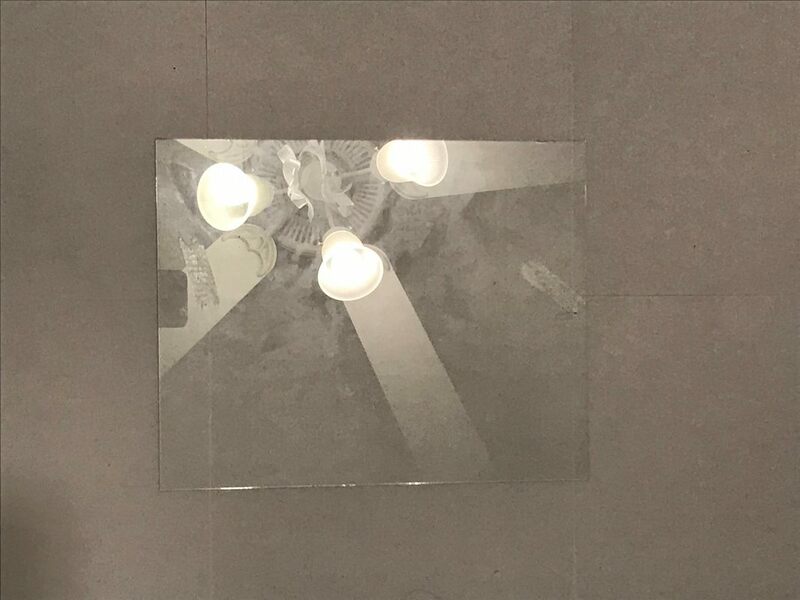 Uneven distribution of heat where lamp can be seen (picture lost). Figure 7. ​Comparison of ambient and surface temperatures in ridged aluminum sheet. Similarly to figure 6, the surface temperature is considerably lower than ambient temperatures during the day and night. Photo shows uneven distribution of heat where tips of ridges are cooler and reflection of heat lamp can be seen. Figure 8. 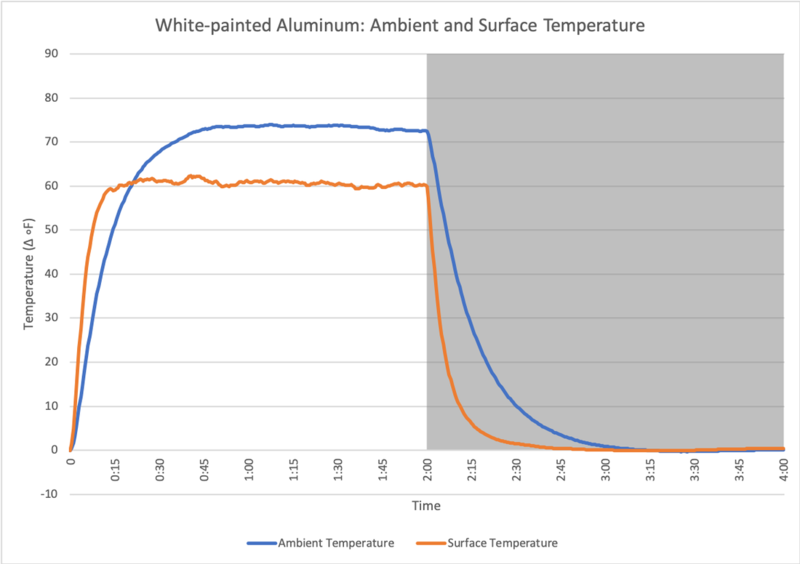 Comparison of ambient and surface temperatures in white-painted aluminum sheet. 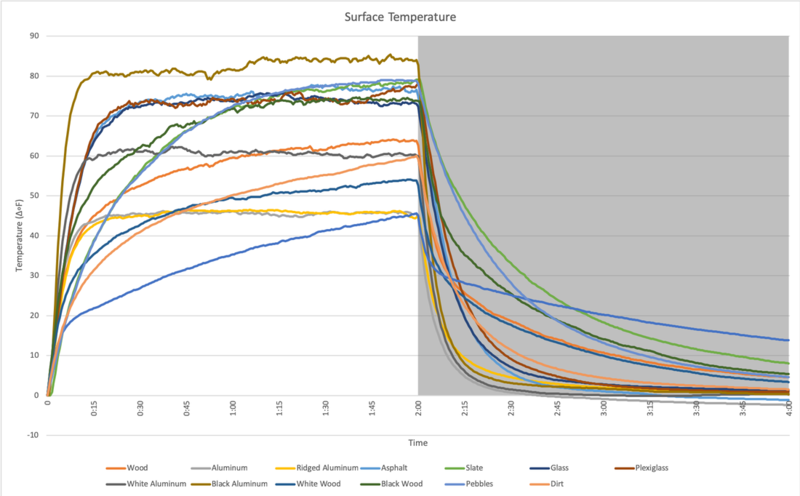 Surface temperature of metal is lower than ambient temperatures but the difference gap is smaller than figures 6 and 7. The heat distribution is uneven along the surface. Figure 9. 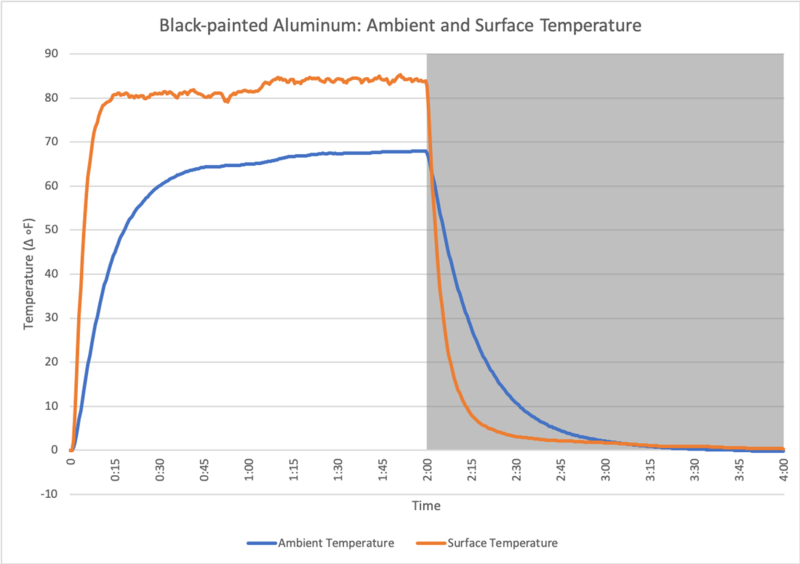 Comparison of ambient and surface temperatures in black-painted aluminum sheet. Surface temperatures are considerable hotter during the day but dramatically drop at night. There is a more even distribution of heat along the surface. Figure 10. 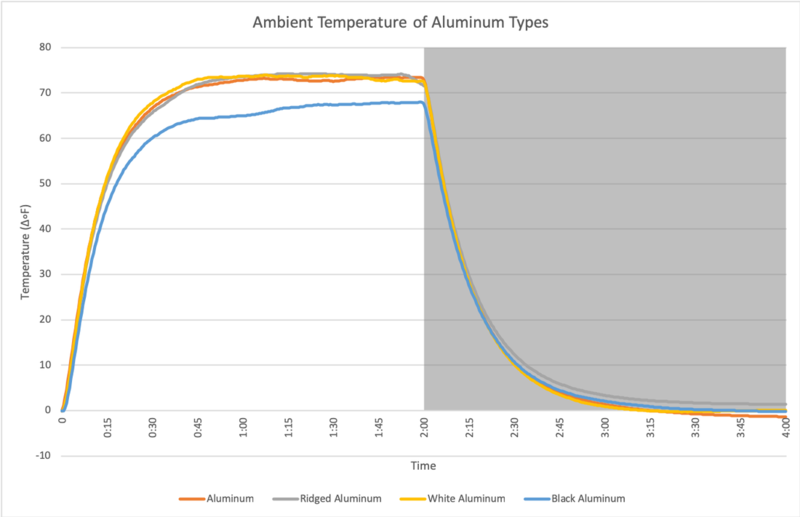 Comparison of ambient temperatures among aluminum, ridged aluminum, white-painted aluminum and black-painted aluminum. Black aluminum shows lowest ambient temperatures during the day. Figure 11. 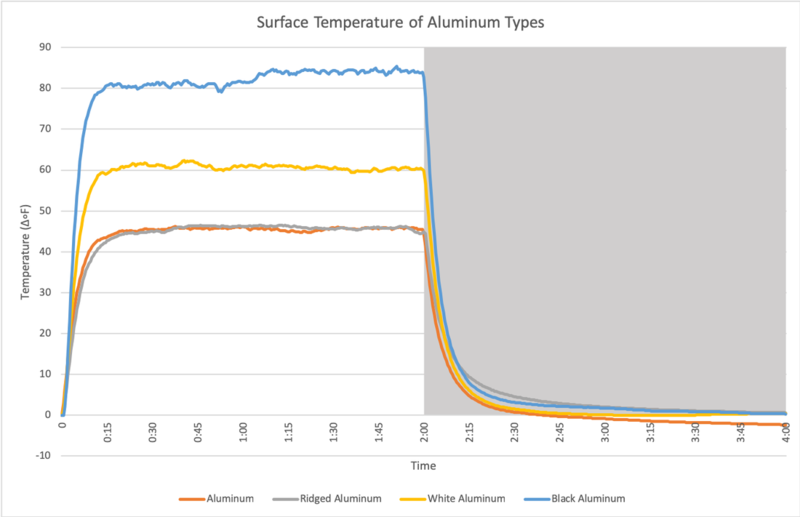 Comparison of surface temperatures among aluminum, ridged aluminum, white-painted aluminum and black-painted aluminum. 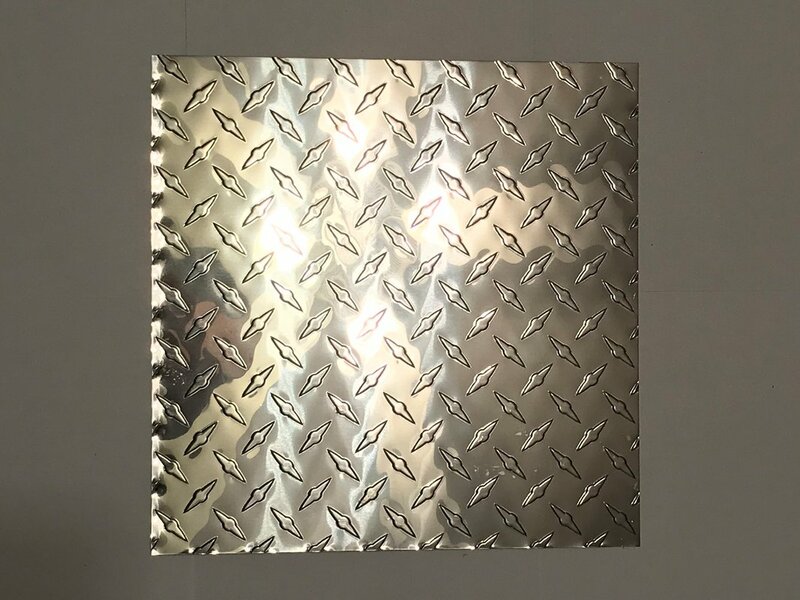 Aluminum and reidged aluminum shows lowest surface temperatures and black aluminum show highest surface temperatures during the day. At night, they all drop to similar temperatures. Figure 12. ​Comparison of ambient and surface temperatures in concrete. Surface temperatures are significantly lower than ambient temperatures during the day but greater during the night. Thermal image shows low surface temperatures and concentration of heat in one area. Figure 13. 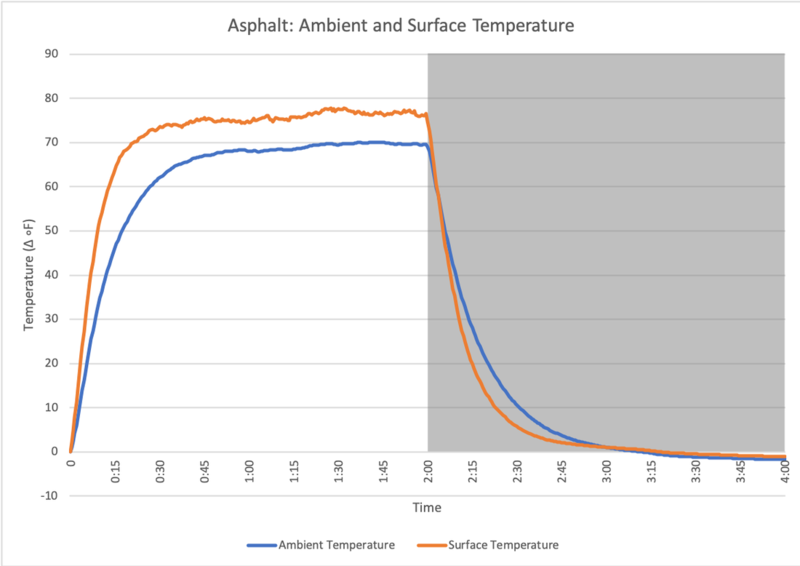 Comparison of ambient and surface temperatures in asphalt. Surface temperatures are greater than ambient temperature during the day and lower during the night. Figure 14. 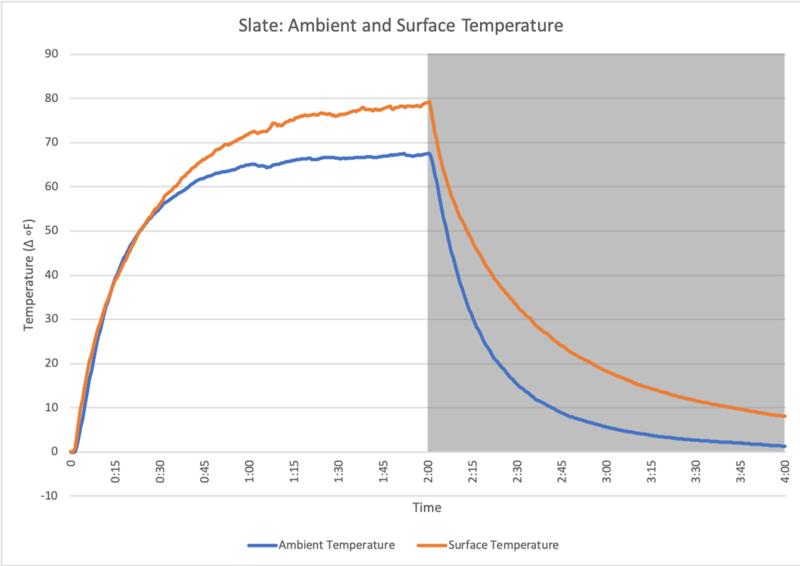 Comparison of ambient and surface temperatures in slate. Surface temperatures are greater than ambient temperature during the day and night. Can notice diagonal patterns on thermal imaging. Figure 15. 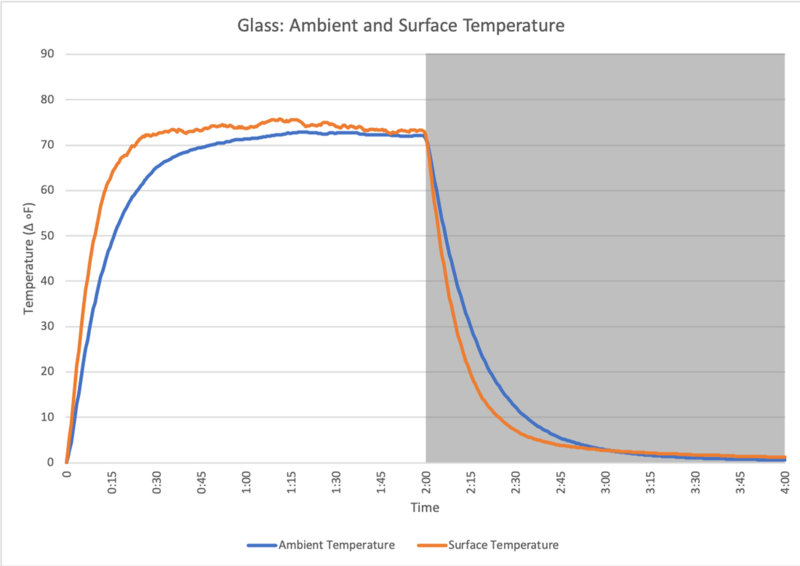 Comparison of ambient and surface temperatures in glass. Surface temperatures are slightly greater than ambient temperature during the day and lower during the night. Extremely uneven distribution of heat. Can see heat reflection from heat lamp. Figure 16. Comparison of ambient and surface temperatures in plexiglass. Surface temperatures are slightly greater than ambient temperature during the day and lower during the night. 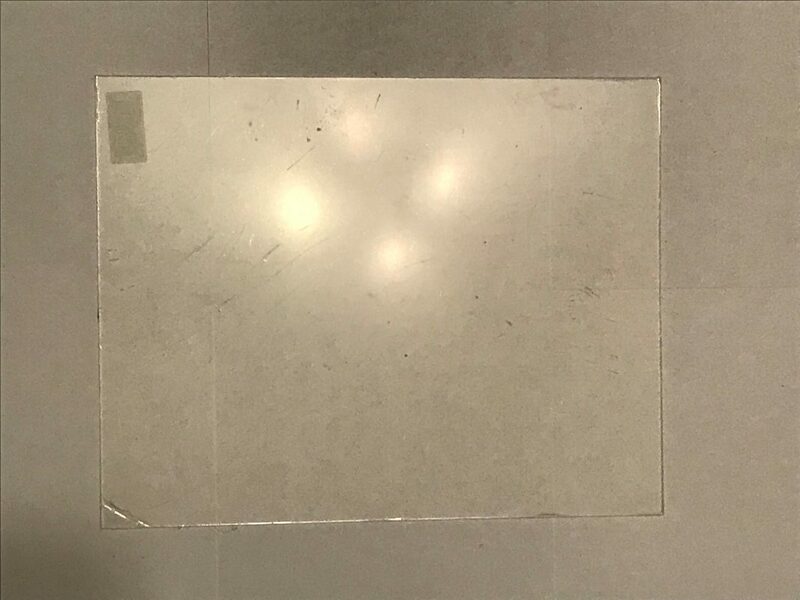 Thermal image is missing but shows a similar pattern to glass. Figure 17. Comparison of ambient and surface temperatures in loose pebbles. Surface temperatures are greater than ambient temperature during the day and night. 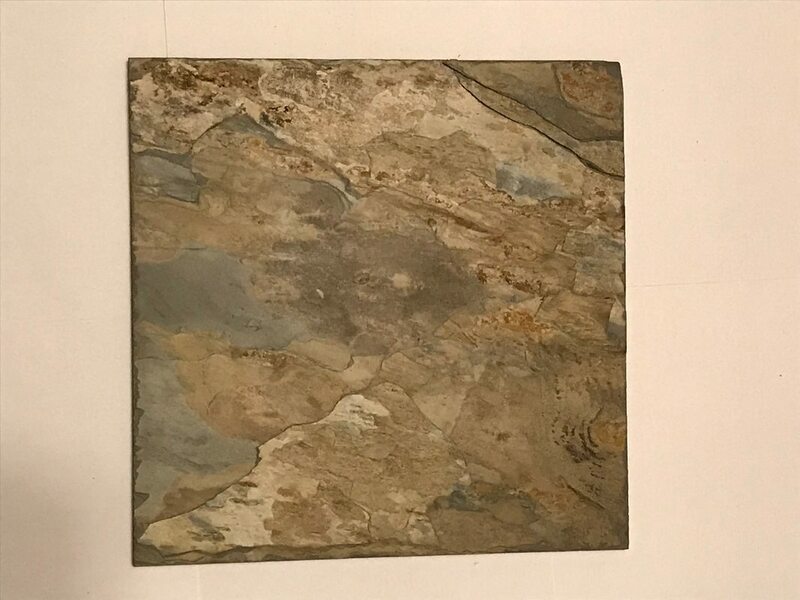 Similar pattern to slate. Figure 15. 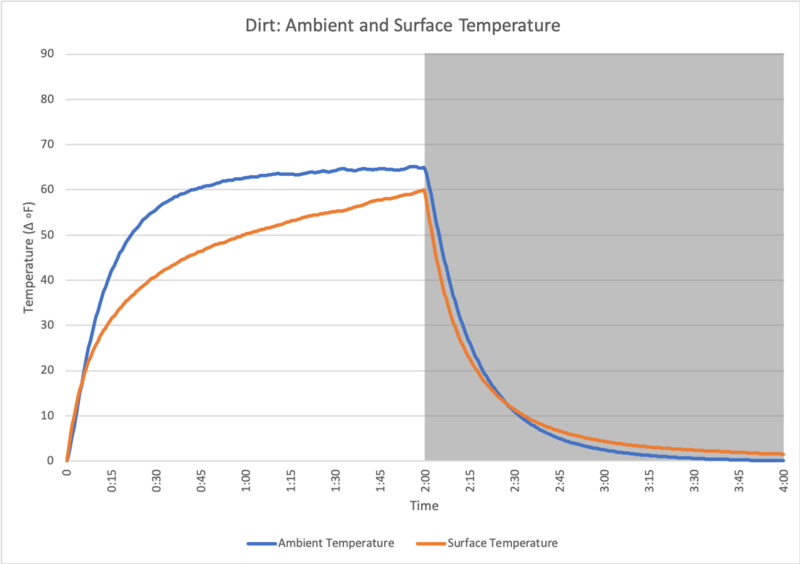 Comparison of ambient and surface temperatures in dirt. Surface temperatures are lower than ambient temperature during the day and quickly equilibrates with ambient temperatures during the night. Figure 16. 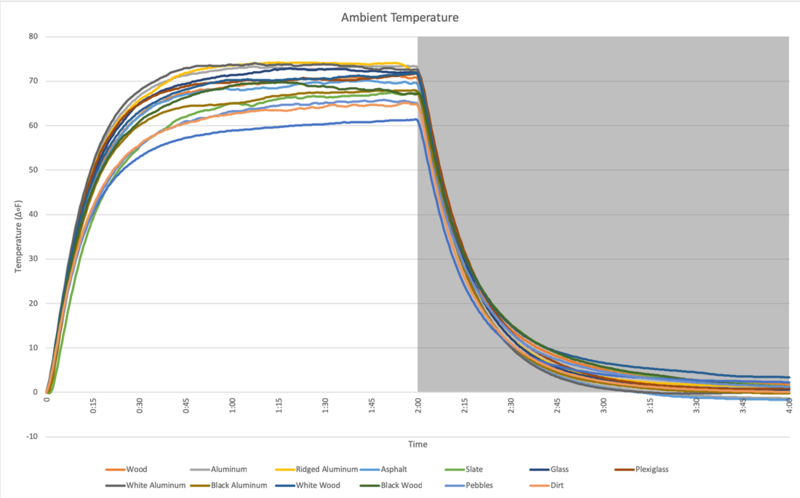 Comparison of ambient temperatures among all materials. 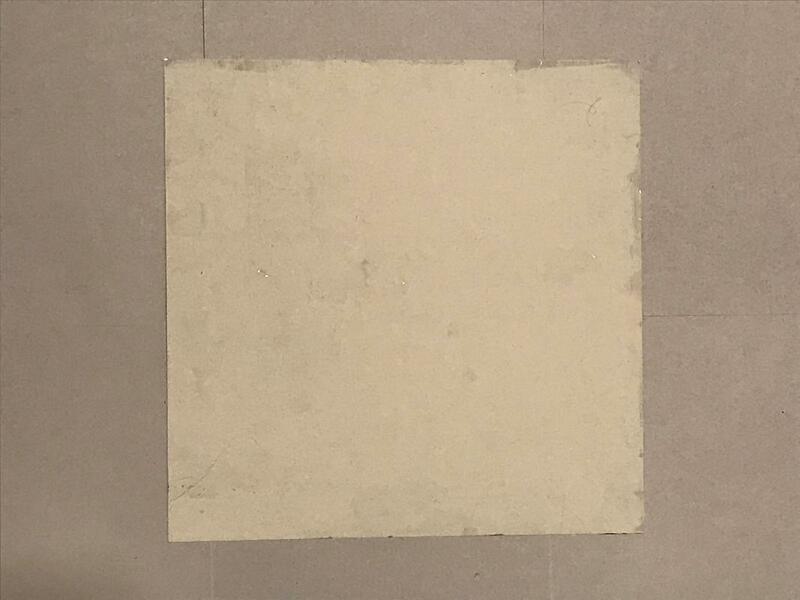 There is an approximate 10 degree difference between the hottest ambient temperature (white-painted aluminum) and the lowest (concrete) during the day and a 5 degree difference between the hottest ambient temperature (white wood) and the lowest (asphalt) during the night. ​Figure 17. Comparison of day (2hr mark) and night (4hr mark) ambient temperature difference among different materials. 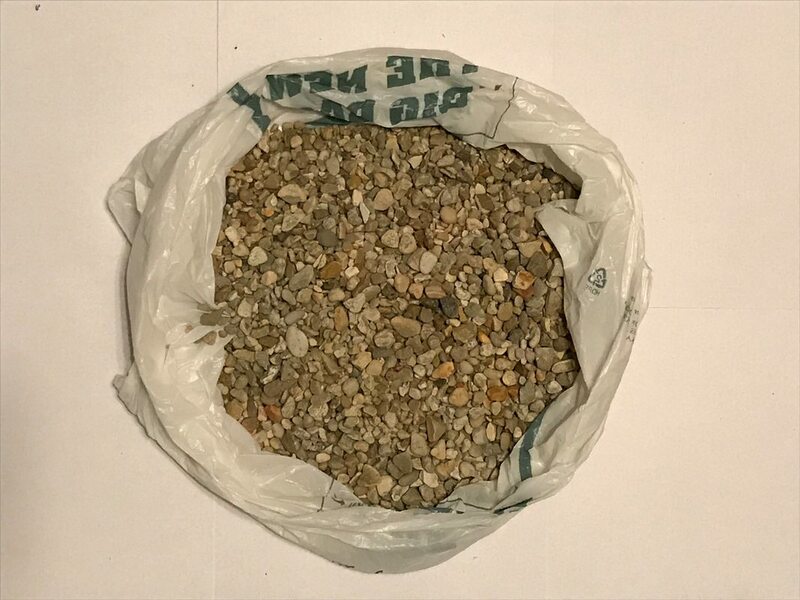 Concrete shows to have the least effect on ambient temperatures. 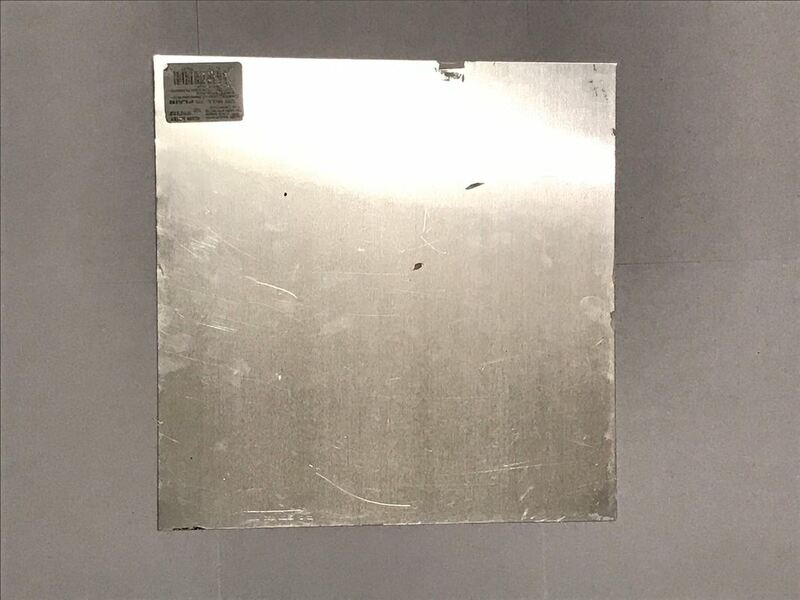 Aluminum shows to have the greatest effect on ambient temperatures. Figure 18. 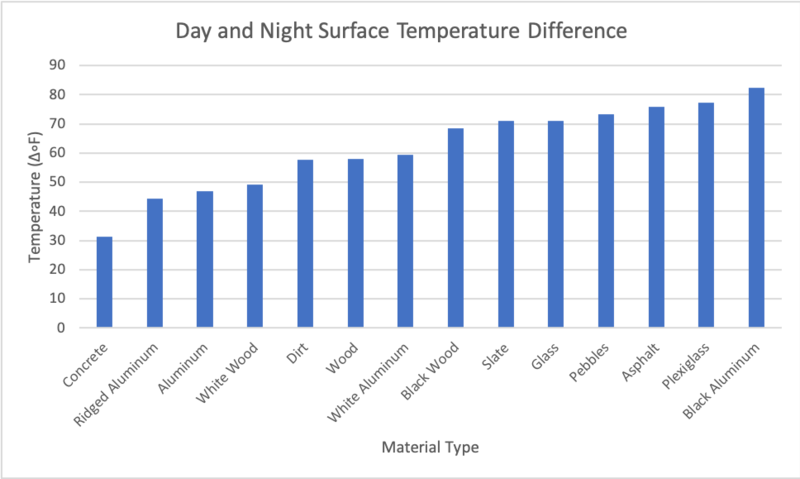 Comparison of surface temperatures among all materials. 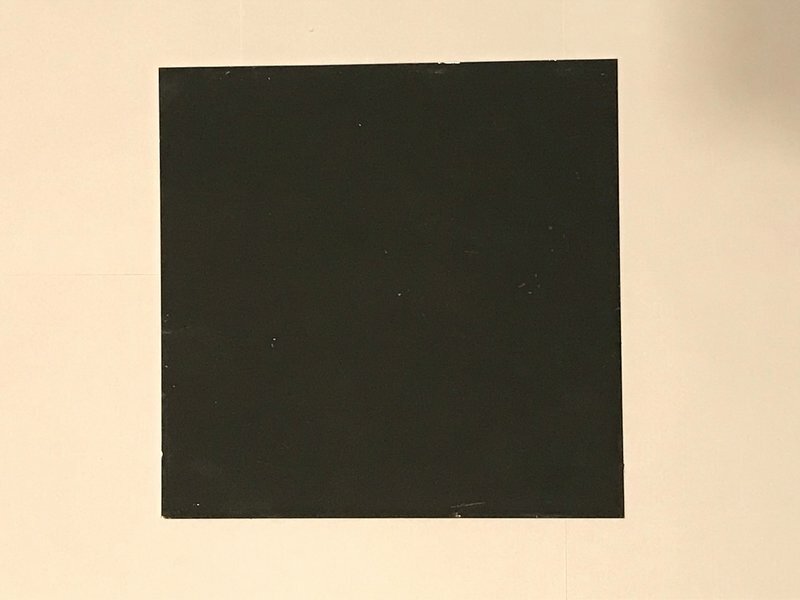 There is an approximate 38 degree difference between the hottest surface temperature (black-painted aluminum) and the lowest (aluminum) during the day and a 16 degree difference between the hottest surface temperature (black-painted aluminum) and the lowest (concrete) during the night. 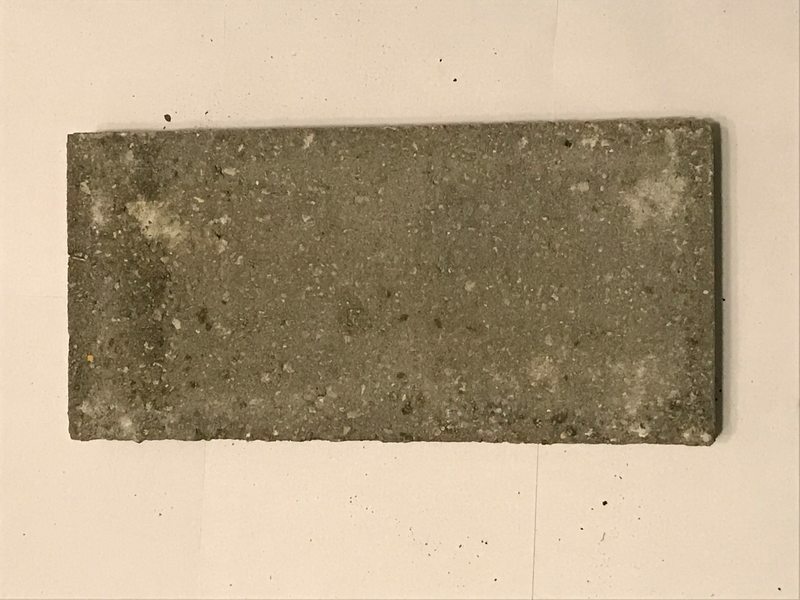 Interestingly, concrete seems to least effect on ambient temperatures and doesn't absorb a lot of heat which is contradictory to other studies. The source of this error can be from any of the contributing factors below. 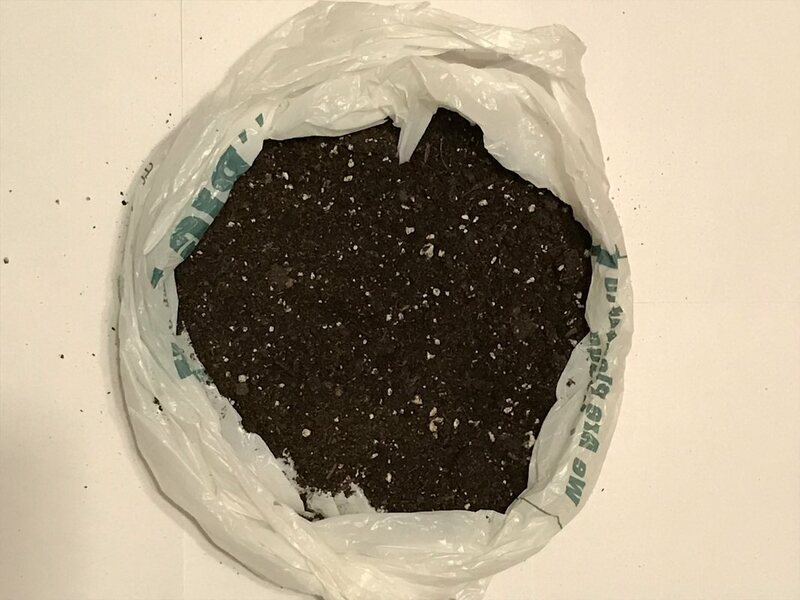 The best in between with the lowest ambient temperature difference and surface temperature difference is dirt. This finding verifies that large-scale implementation of "greening" cities, can help mitigate Urban Heat Island Effect such as having green roofs, rain gardens, etc. What can be done differently next time? Future research?